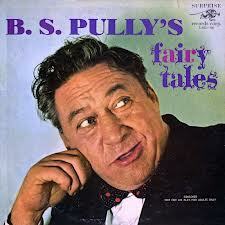 Tonight’s entry is one of my favorite bad comedy albums: B. S. Pully’s Fairy Tales. This album is one of those early raunchy anti-PC records (pretty tame by today’s standards) like those of Belle Barth, Rusty Warren and Pearl Williams. I found it in a record store in Rochester, NY filed under “children’s records.” Ha! Pully was a supporting actor whose most famous role was that of Big Jule in Guys and Dolls. He appeared in other films too, like Cat Ballou and The Love God? (starring Don Knotts) which has got to be one of the most obscene G-rated films ever. One of the main reasons why I love this album is that Pully has the greatest voice for stand-up comedy ever. When he tells you he works the terlet , you believe him. With that chain-cigarette and whiskey voice, he sounds like he could have been the bouncer for his own shows. A few things you’ll notice here are that many of his jokes are not funny and he comments on how people are not laughing at them. Also, you’ll notice the same annoying recorded laugh loop running through most of the album. It’s a pretty sloppy mixing, but hey, it adds character. Enjoy the ‘venereal material’! Originally posted on my previous blog,”DamnThatOjeda,” on March 27, 2008. Has it been 5 years already?